Chocolate and Hazelnut Stuffed Eggs for sale. Buy online at Zingerman's Mail Order. Gourmet Gifts. Food Gifts. A magic trick moonlighting as an Easter sweet. It started its life as a perfectly proper egg. Then the insides were removed, deployed for dinner, the shell rinsed. Next it was filled with two ounces of Venchi's supremely luxurious hazelnut and chocolate gianduja, the most popular sweet in the Piedmont region of Italy. The shell was decorated and remains perfectly intact. It cracks and peels just like a hard boiled egg, albeit an egg laid from a chocolate chicken. 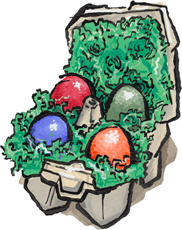 Dispense them into Easter baskets if you must, but make sure to hide a couple for the Easter Bunny.